A few years ago I completed an elimination diet to determine if I had any food sensitivities. I was experiencing acne on my chin and bloating after delicious lattes and knew that something needed to change. In all honesty, the diet wasn’t fun — the nightshade family is filled with delicious foods — but it was an eye-opening experience to see which foods were causing symptoms in my body. When we eat particular foods that don’t agree with our system, our bodies can produce an immune response against them in the form of antibodies. These antibodies differ based on whether the food triggers an allergy or sensitivity. Immediate – this is an IgE reaction. Symptoms will occur within minutes of exposure or ingestion of the food and can even be life-threatening (ie. peanut allergy). You may see: hives, itchy and watery eyes, and even breathing difficulties. Testing for this type of allergy requires a blood draw and diagnosis is made by an allergist. Delayed – this is an IgG reaction. These are usually delayed reactions to food – meaning that you can experience symptoms days after eating the offending food. Symptoms can vary from person to person but can include migraines, irritable bowel syndrome (alternating diarrhea and constipation), bloating and indigestion, fatigue, weight gain or difficulty losing weight, and even eczema. Testing for food sensitivities can be done by elimination diets or via an IgG food sensitivity testing (which is actually covered by some insurance providers in Canada). If you’re wanting results right away, an IgG test is your best bet. Collected via a blood draw, the IgG test can tell you how reactive you are to 120 or 200 foods and herbs. Once you have the results you can stay away from the ‘elevated’ foods, or you can test how exactly they affect you through a diet challenge (where you would consume a serving of food twice in a day, and wait 48 hours to see which symptoms present). Elimination diets are true to their names – you eliminate allergenic foods for about a 3 week period to clear everything from your diet. Once the elimination phase is over, you would begin to add foods back in one family at a time. For instance, you wouldn’t add back both wheat and dairy products, because then you wouldn’t be able to tell which food caused which reaction. Keeping track of the foods causing symptoms is exceptionally important, as you would ideally eliminate them from your diet if they’re wreaking havoc on your system. This is a non-immune reaction to food, therefore will not produce any antibodies. Reactions can occur because of enzyme deficiencies (ie. lactose intolerance due to lactase deficiency), and chemicals present in food additives. If you think that you may have a food sensitivity or intolerance, feel free to contact a naturopathic doctor or another health professional who can order an IgG test and go through the results with you; or even guide and support you through an elimination diet. When I first went gluten and dairy-free (via the elimination diet) 5 years ago, it was incredibly difficult to find high quality and delicious recipes. I must have taken out over 20 books from my local library and scoured the recipes for ones that seemed easy to create! Because food allergies seem to be much more common today, I wanted to share with you some of my favourite cookbooks out on the market. They make meal planning so easy and make my stomach incredibly happy! I love this book (and website) because the recipes are usually 10 ingredients or less, and the majority of recipes are gluten-free. While I primarily follow the paleo diet, I love that they give you vegetable-based recipes that go beyond the traditional salad. I have to admit, the dessert section is my favourite and many of their recipes have been a hit in my house! Some of my favourite recipes: Coconut Cream Pie (husband approved!) and Rainbow Spring Rolls (please make this ASAP). This was one of my go-to resources when I initially went gluten and dairy-free. I especially love this website because the founder, Angela, is from Ontario and uses ingredients that are incredibly easy to find in store. I have the cookbook (linked above) and think it’s a great tool – my only hesitation is that some of the desserts require many ingredients, which can be rather costly. I tend to avoid most of the desserts and see if I can source them from elsewhere (like the Minimalist Baker). Some of my favourite recipes: Big Vegan Bowl, Banana Bread Muffin Tops (brother approved!) and Pink Power Detox Smoothie (my favourite smoothie EVER). This book started my foray into the paleo diet. I really took to adopting a mostly paleo lifestyle (I won’t give up my peanut butter and hummus!) because it encompasses the gluten and dairy-free restrictions. I started using this book specifically to get breakfast ideas that went beyond the typical (yet delicious) eggs and bacon. I originally bought this book for my husband specifically for summer grilling. However, having a stove with a grill inset was quite fortuitous and we’ve been finding ourselves referencing this book year round. While this book doesn’t accommodate for any dietary restrictions, most grilling recipes don’t call for flour or dairy. I also usually swap ingredients to make the recipes a bit healthier (ie. coconut sugar for brown sugar). Your turn! Did I miss any cookbooks? Share your favourites in the post below! 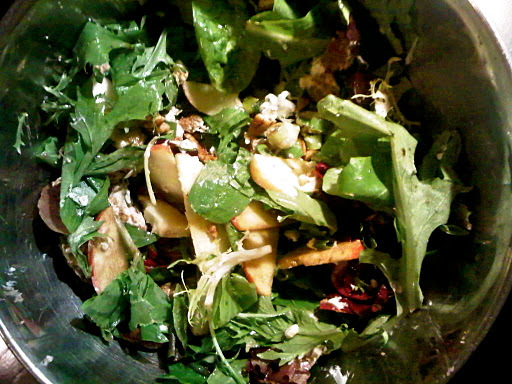 A light, but satisfying dinner – mixed greens, gala apple, goat cheese, free range chicken (coated with cumin, cayenne, cinnamon, and garlic powder), and pecans – tossed in extra virgin olive oil and balsamic vinegar. My culinary skills have definitely improved and expanded due to the diet.